Thomas Clark on 19 dec 1791 conveyed property to trustees: Patrick Cannell, Philip Corlet, William Craine, John Killip, Christopher Brew, Daniel Cowley, Thomas Cottier, Thomas Corlet and Thomas Clark all of Ballaugh. 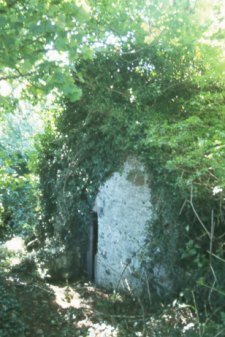 The Chapel was built but soon found considerably too small and needed to be enlarged, but no room to expand, but there was a restrictive clause reverting property back to William Stephen if land no longer used for Chapel. In 1806 William Stephen removed the restrictive covenant + provided additional land for enlargement. 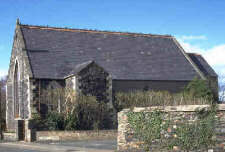 Supposedly used stones from nearby keeill; Used as Sunday School/hall on completion of new Chapel; however economics have now (1999) forced closure of new chapel with services reverting back to hall. 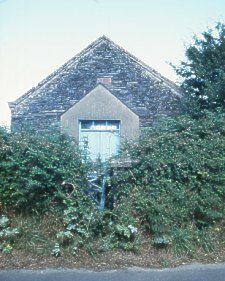 Original chapel 1815 - 'sod' chapel; Closed 1971; now used as farm garage (entrance from field through demolished east wall) - the front and sides are now completely overgrown with brambles etc. 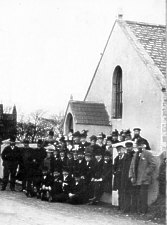 In 1851 Religious Census described as dating from 1833 and having 100 seats - no return of attendance is given as probably no service as times were indicated as 2.30pm and 6pm on alternate weeks.